Cinema’s fascination with “the wrong man” is rather vast and limitless; it was obviously a particular favorite trope of Hitchcock, but it was also mined early and often by the horror genre, which took the concept and twisted it into a proposition of vengeance. Even Son of Frankenstein had an interesting play on this when Ygor slipped the hangman’s noose and enlisted the Monster to murder his would-be executioners. Hailing from Poverty Row in 1946, Strangler of the Swamp is a supernatural take on the trend that recalls that old, persistent adage from the movies: if you’re going to kill someone, you’d better make sure they’re dead…soul and all. 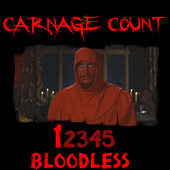 The inhabitants of a patch of swamp land are spooked out by a rash of mysterious, grisly deaths that are connected by their eeriness: each victim was strangulated and were connected to the execution of a ferryman several years ago. As the ferryman’s guilt was always in question, the panicked swamp-dwellers now believe he’s come back to take revenge on those who wronged him. Since it deals with very familiar tripe, Strangler of the Swamp is one of those films that reminds us of the importance of mise-en-scène. Its opening credits are accompanied by a foreboding shot of a dangling noose, which expertly frames and introduces the film’s true star: the fog-shrouded swamp that sprawls with ominous, sinewy trees. The ferry represents the lone way in or out, and there’s a menacing sort of isolation to the place. While the film’s sparse setting is no doubt a result of its limited budget, director Wisbar makes it a strength by infusing it with an overbearing gloominess. This is actually a remake of his own film, Fahrmann Maria, and he ports the gothic leanings of his native Germany over in this translation. While it’s not as overtly stylish and expressionist as early German horror, Strangler of the Swamp is bathed in shadows, mist, and moonlight and feels like a spectral dream not unlike The Vampyr. The persistent presence of the ferry recalls Charon and the River Styx, and it’s almost as if viewers are transported to a dismal underworld inhabited by the sprits of the living and the dead. Its titular strangler is similarly phantasmagoric. Brought to life using crude transparency effects and understated makeup, he’s akin to a shadow that often blends into the already bleak surroundings. Those he strangles are less memorable, perhaps because the film’s brevity prevents real depth and impact; however, the collective townspeople make up for their lack of characterization by serving an important function. Horror can sometimes get away with telling more than showing, and this is one of those instances, as the superstitious characters sell you the phantom strangler as a ghost story writ large before you ever see him. Beyond that, typical stuff happens, such a budding romance between the strangler’s granddaughter (Rosemary La Plance) and the son of one of the hangmen (Blake Edwards, who would go on to have a prolific writing/directing career). There is an interesting karmic quality about the current generation paying for the sins of their fathers, and the film’s ending briefly muses on how vengeance can unsettle the soul, but this is a mostly straightforward jaunt into revenge from beyond the grave. That’s pretty much what you should expect, given its PRC origins (no, the “PR” doesn’t stand for “Poverty Row,” but rather “Producers Releasing”). Like its fellow independent studios, its legacy is the cheap, B-movie relics that were slapped together to cash in on contemporary trends. 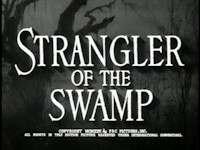 Strangler of the Swamp is no different, as it’s an obvious riff on Universal and Val Lewton, only the acting and setting feels even more stage-bound. No doubt thanks to Wisbar’s forceful, atmospheric vision, Strangler of the Swamp has emerged as one of PRC’s more well-received efforts. He would go on to direct the inferior Devil Bat’s Daughter during the same year; in fact, I wouldn’t be surprised if that film was directed days or weeks after this one, as they share many of the same cast and crew (it’s also not infeasible because they were cranking this suckers out so quickly). This effort certainly stretches every bit of its meager budget and manages to gracefully emerge from the murky bog that is its languid pacing and familiar story. Though it feels like a film that was destined to show up on dozens of public domain releases, this isn’t the case; instead, you’ll have to track down the lone DVD release, which came from Image all the way back in 1999. Miraculously still in print and readily available (though without special features), the presentation is good enough considering the already creaky production origins. Presented in the correct 1.33 aspect ratio, the transfer is expectedly rough, and the mono track is obviously thin, but it works. Perhaps not a bona-fide unsung treasure, but pretty close, Strangler of the Swamp is a quaintly alluring work of a director doing the best he could with a shoestring aesthetic. Buy it!